Early leadership theorists believed there was generally one best style to lead and manage people in most situations. Later theorists (eg, Hersey and Blanchard) asserted that the best leadership style to use depends on the situation at the time, and the readiness of the people you are leading. Directing/Telling Leaders define the roles and tasks of the follower, and supervise them closely. Decisions are announced by the leader, so communication is largely one-way. Coaching/Selling Leaders still define roles and tasks, but seek input from the follower. Decisions remain the leader’s prerogative, but communication is more two-way. Supporting/Participating Leaders pass day-to-day decisions to the follower. The leader facilitates and takes part in decisions, but control is with the follower. Delegating Leaders are still involved in decisions and problem-solving, but control is with the follower. The follower decides when and how the leader will be involved. No one style is considered optimal or desired for all leaders to possess. Effective leaders need to be flexible, and must adapt themselves according to the situation. However, each leader tends to have a natural style, and in applying Situational Leadership they must know their intrinsic style. Arguably there has always been an excessive focus on leadership, but we need to recognise that there are no leaders without followers – hence the concept of followership. 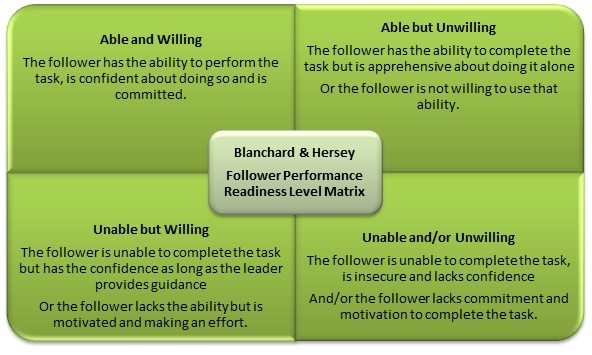 This Hersey & Blanchard model works on the premise that there is no one best way to influence followers. The most effective leadership style depends on the readiness level of followers. Readiness is defined as the extent to which a follower has the ability and willingness or confidence to accomplish a specific task. The concept of readiness is not a characteristic; it relates to a specific task. As the readiness of a follower increases, a leader should rely less on task behaviour and more on relationship behaviour. Task behaviour is the extent to which the leader spells out the duties and responsibilities of and individual or group. It includes giving directions and setting goals. Relationship behaviour is the extent to which the leader engages in two-way or multi-way communication. It includes listening, providing encouragement and coaching. The distinctions among followers are every bit as important as those among leaders, and have critical implications for how leaders should lead (and managers should manage). In any given work environment, the success of an organisation is a function of the knowledge, abilities and style of both the leaders and the followers. This further emphasises the need for leaders to vary their style to suit different situations, circumstances and people. There is no one best way to be a team leader – the most effective leadership style depends on the readiness level of staff members.